1. Plan the WLAN network topology. Decide where to locate each access point to maximize accessibility to the WLAN by wireless clients and to minimize radio frequency (RF) interference by other access points. You should also determine how to integrate the D-Link Unified Switch into your existing network topology. 2. Install and configure the D-Link Unified Switch. To install and configure the D-Link DWS-3026 switch, you need a serial connection to the switch, or you must connect to the switch from a host in the same subnet as the switch default IP address (10.90.90.90/8). From the initial connection to the switch, you can configure basic network information or enable the DHCP client on the switch to acquire this information automatically. 3.Enable the WLAN switch function and assign an IP address to the WLAN switch interface. The WLAN features on the switch are enabled by default. The WLAN feature must be enabled in order for the switch to discover and validate D-Link Access Points. If the routing mode is disabled, the Unified Switch function uses the IP address of the network interface. If routing is enabled, the switch uses a loopback or routing interface for the wireless functions. Changing the IP address of the network interface automatically disables and re-enables the wireless function. 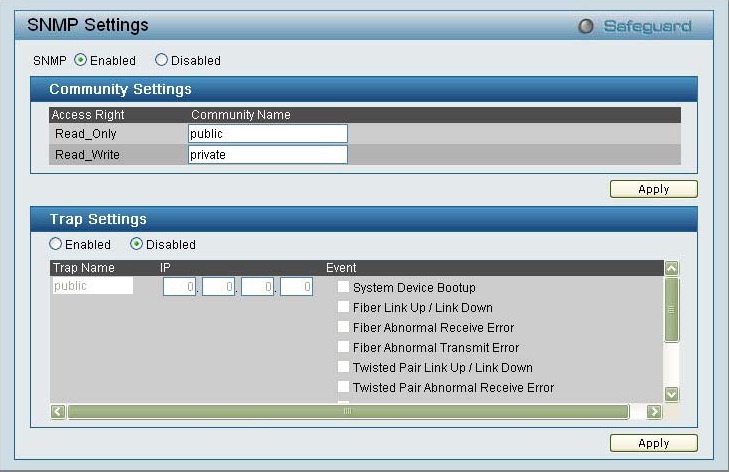 Enabling routing also disables and reenables the wireless function. 4.Configure the default AP Profile settings that the access point will use after the D-Link DWS-3026 switch validates it. When the switch successfully validates an access point, it sends the AP Profile to the access point. The AP Profile contains all of the access point configuration information,such as the radio, security, and SSID settings. You can configure all of the AP settings before or after the switch validates an AP. 5.Prepare and deploy D-Link Access Points and enable AP-to-switch discovery. After you connect an AP to the network and it obtains an IP address (either statically or dynamically by using DHCP), the Unified Switch can automatically discover the AP. However, if your network uses IEEE 802.1X authentication or you require the AP to be authenticated by the D-Link DWS-3026 switch upon discovery, you must log on to the AP and configure security information. 6.Authenticate and validate the APs. You can optionally configure the Unified Switch so that it only manages APs that it authenticates. You can use the local database or an external RADIUS database for AP authentication. Whether or not you require AP-to-Unified Switch authentication, the switch must be able to validate an AP before it can manage the AP. For the D-Link DWS-3026 switch to validate the AP, you must add the MAC address of each AP to the AP database on the switch or to the database on an external RADIUS server. CAUTION: The default AP profile does not use a security mechanism for wireless client associations. All wireless clients will be able to connect to an AP and access your network. D-Link DES-1200 Series Include:D-Link DES-1210,DES-1228,DES-1250,DES-1252.This article teaches you to how to set 802.1X Settings on DES-1200 Series Web Smart Switch. Network switches provide easy and open access to resources by simply attaching a client PC. Unfortunately this automatic configuration also allows unauthorized personnel to easily intrude and possibly gain access to sensitive data. IEEE-802.1X provides a security standard for network access control, especially in Wi-Fi wireless networks.802.1X holds a network port disconnected until authentication is completed. The switch uses Extensible Authentication Protocol over LANs (EAPOL) to exchange authentication protocol client identity (such as a user name) with the client, and forward it to another remote RADIUS authentication server to verify access rights. The EAP packet from the RADIUS server also contains the authentication method to be used. The client can reject the authentication method and request another, depending on the configuration of the client software and the RADIUS server. Depending on the authenticated results, the port is either made available to the user, or the user is denied access to the network. The RADIUS servers make the network a lot easier to manage for the administrator by gathering and storing the user lists. By default, 802.1X is disabled. To use EAP for security, select enabled and set the 802.1X Global Settings for the Radius Server and applicable authentication information. Authentication Port: sets primary port for security monitoring. Default is 1812. Key: Masked password matching the Radius Server Key. Confirm Key: Enter the Key a second time for confirmation. TxPeriod: Sets the number of seconds that the switch waits for a response to an EAP-request/identity frame from the client before retransmitting the request. Default is 24 seconds. ReAuthEnabled: This enables or disables the periodic ReAuthentication control. When the 802.1X function is enabled, the ReAuthEnabled function is by default also enabled. QuietPeriod: Sets the number of seconds that the switch remains in the quiet state following a failed authentication exchange with the client. Default is 80 seconds. SuppTimeout: Sets the switch-to-client retransmission time for the EAP-request frame. Default is 12 seconds. ServerTimeout: Sets the amount of time the switch waits for a response from the client before resending the response to the authentication server. Default is 16 seconds. MaxReq: This parameter specifies the maximum number of times that the switch retransmits an EAP Request packet to the client before it times out the authentication session. Default is 5 times. ReAuthPeriod: This command affects the behavior of the switch only if periodic re-authentication is enabled.Default is 3600. To establish 802.1X port-specific assignments, select the From Ports / To Ports and select enable. The following window is used to Ping an IPv6 address. This window allows the following parameters to be configured to ping an IPv6 address. Target IPv6 Address:Enter an IPv6 address to be pinged. Interface:The Interface field is used for addresses on the link-local network. It is recommended that the user enter the specific interface for a link-local IPv6 address. For global IPv6 addresses, this field may be omitted. Repeat Times:Enter the number of times desired to attempt to ping the IPv6 address configured in this window. Users may enter a number of times between 1and 255. Size:Use this field to set the datagram size of the packet, or in essence, the number of bytes in each ping packet. Users may set a size between 1 and 6000 bytes. The default setting is 100 bytes. Timeout:Select a timeout period between 1 and 99 seconds for this Ping message to reach its destination. If the packet fails to find the IPv6 address in this specified time, the Ping packet will be dropped. Source IPv6 Address:Tick the check box and enter the source IPv6 address of the ping packets. If specified, the IPv6 address will be used as the packets’ source IPv6 address that ping6 sends to the remote host. IPv6 neighbors are devices on the link-local network that have been detected as being IPv6 devices. These devices can forward packets and keep track of the reachability of routers, as well as if changes occur within link-layer addresses of nodes on the network or if identical unicast addresses are present on the local link. The following two windows are used to view IPv6 neighbors, and add or delete them from the Neighbor cache. The following window is used to view and configure current IPv6 neighbors of the Switch. Interface Name:Enter the Interface Name of the device for which to search IPv6 neighbors. Click Find to begin the search. Neighbor IPv6 Address:Enter the IPv6 address of the neighbor of the IPv6 device to be searched. Click Find to begin the search. State:Users may also search by running state of the IPv6 neighbor. Tick the State check box and choose to search for Static IPv6 neighbors or Dynamic IPv6 neighbors. Click Find to begin the search. Neighbor IPv6 Address:Displays the IPv6 address of the neighbor device. State:Displays the running state of the corresponding IPv6 neighbor. The user may see six possible entries in this field, which are Incomplete, Stale, Probe, Reachable, Delay, or Static. Link Layer MAC Address:Displays the MAC address of the corresponding IPv6 device. Port:Displays which port learned the IPv6 address of the neighbor device. Interface:Displays the interface name associated with this IPv6 address. VID:Displays which VLAN learned the IPv6 address of the neighbor device. A VLAN is a group of ports that can be anywhere in the network, but communicate as though they were in the same area. 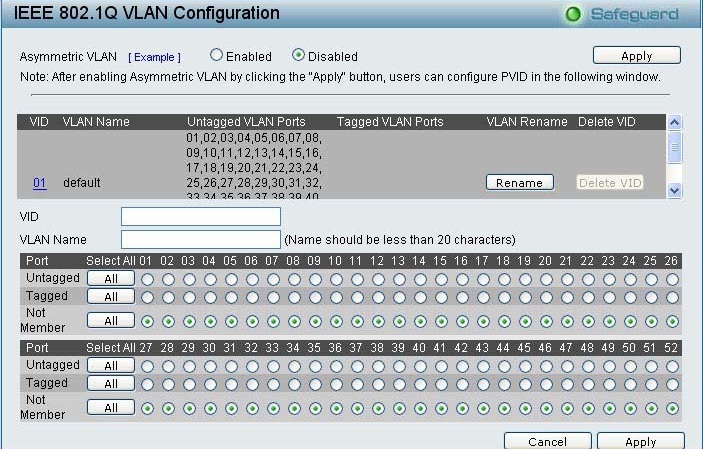 VLANs can be easily organized to reflect department groups (such as R&D, Marketing), usage groups (such as e-mail), or multicast groups (multimedia applications such as video conferencing), and therefore help to simplify network management by allowing users to move devices to a new VLAN without having to change any physical connections. The IEEE 802.1Q VLAN Configuration page provides powerful VID management functions. The original settings have the VID as 01, named “default”, and all ports as “Untagged”. Rename: Click to rename the VLAN group. Delete VID: Click to delete the VLAN group. Add New VID: Click to create a new VID group, assigning ports from 01 to 28 as Untag, Tag, or Not Member:A port can be untagged in only one VID. To save the VID group, press Apply.You may change the name accordingly to the desired groups, such as the aforementioned R&D, Marketing,email, etc. Simple Network Management Protocol (SNMP) is an OSI Layer 7 (Application Layer) designed specifically for managing and monitoring network devices. SNMP enables network management stations to read and modify the settings of gateways, routers, switches, and other network devices. Use SNMP to configure system features for proper operation, monitor performance and detect potential problems in the Switch or LAN. Managed D-Link DES-1228 that support SNMP include software (referred to as an agent), which runs locally on the device. A defined set of variables (managed objects) is maintained by the SNMP agent and used to manage the device. These objects are defined in a Management Information Base (MIB), which provides a standard presentation of the information controlled by the on-board SNMP agent. SNMP defines both the format of the MIB specifications and the protocol used to access this information over the network. 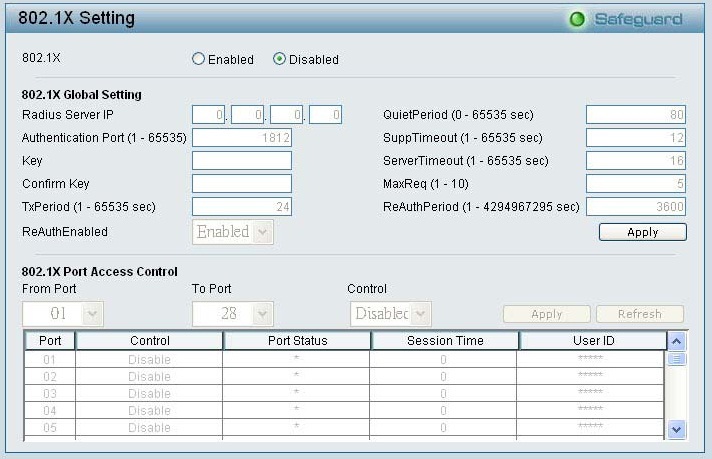 The default SNMP setting is disabled. Click enable, then Apply, to set Community Settings. Community Setting: In support of SNMP version 1, the Web-Smart Switch accomplishes user authentication by using Community Settings that function as passwords. The remote user SNMP application and the Switch SNMP must use the same community string. SNMP packets from a station that are not authenticated are ignored (dropped). Public: The community with read-only privilege allows authorized management stations to retrieve MIB objects. Private: The community with read/write privilege allows authorized management stations to retrieve and modify MIB objects. Trap Setting: Traps are messages that alert network personnel of events that occur on the Switch. Such events can be as serious as a reboot (someone accidentally turned the Switch OFF), or less serious events such as a port status change. The Switch can generate traps and send them to the trap recipient (i.e. network administrator).